Established over 10 years ago, Ignition Driving School knows what it takes to help you get through your driving test in Maidstone. Our fully qualified, driving instructor, local to Maidstone, has plenty of experience to help you learn to drive no matter what your ability. Whether you need one or two driving lessons to help you once you have passed your driving test or you are a beginner with no driving experience at all, Ignition Driving School has the right driving course for you. Ignition Driving School also runs intensive driving courses in Maidstone for those who need to get up to driving test standard a bit more quickly. Currently we offer the first driving lesson for FREE in Maidstone for beginners! Here at Ignition Driving School we don't believe in complicated pricing structures or gimmicks with strings attached to entice you to book. Instead we offer a sensible, fair pricing system, which will stay with you throughout your course of driving lessons in Maidstone. We also run a loyalty card scheme too, allowing you to earn up to £105 in high street vouchers for simply referring friends to the school - so learning to drive really can be rewarding! 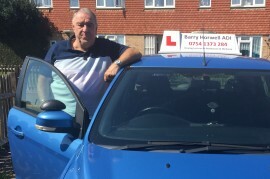 Thanks very much to Barry, who is very patient and knowledgeable about driving and the specific test routes themselves. I managed to pass with only two minors, and Barry made me feel very relaxed during the test with good explanations of everything I could encounter whilst out. Would recommend to anyone! Barry’s no-nonsense, uncomplicated approach to driving tuition is highly refreshing. His patient and calm demeanour put you at ease and allow you to focus on the drive without stress. I passed first time thanks to Barry’s excellent tuition and would highly recommend him to anyone looking to learn to drive, whatever your level. To check out our pricing or if you would like to book a driving lesson then all the information you need is on this website, simply click on the relevant quick links below.